In the last post, we revealed a few tips that, although they may seem basic, are recommended by professionals to help preserve hard work and perform a high-quality job. But there are many more tips that can help you avoid even small mistakes that can impact your painting job's integrity and value. Here's part two of our three-part homeowner's guide to painting like the pros. 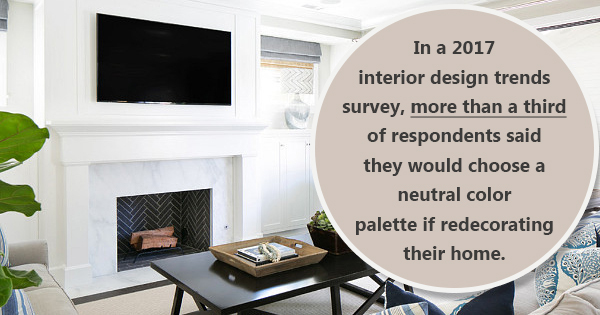 Cover Furniture Top to Bottom In a 2017 interior design trends survey, more than a third of respondents said they would choose a neutral color palette if redecorating their home. But whichever color you're using, make sure to cover all surrounding furniture carefully. Though this may seem like a given, many DIY painters only cover the tops of their furniture pieces and leave the bottom legs open and exposed, but this could still cause damage from splatter and cause it to gather dust from sanding. If you can't remove the furniture from the room altogether, covering it fully from top to bottom is the next best bet. Consider Tinted Primer Many professionals are accustomed to filling holes and patching cracks with a joint compound before painting. But either way, applying paint directly on top of this layer causes a dull and dreary look known as 'flashing.' Avoid this by carefully applying a high-quality primer across the entire surface. While most primers are clear or white, consider getting a tinted shade for better concealing. "Instead of using white primer, pros usually have it tinted gray or a color that's similar to the finish paint. Tinted primer does a better job of covering the existing paint color than plain primer, so your finish coat will be more vibrant and may require fewer coats. This is especially true with colors like red or orange, which could require three or more coats without a primer," writes Brett Martin on Popular Mechanics. Unfortunately, the primer step is where most DIY painters make the most mistakes. Yet it is absolutely essential to get this step right. These tips can help you sprinkle some professional techniques into your DIY painting strategies. Of course, it's also a good idea to invest in porch and floor paint that protects against radiation. For more information about environmentally friendly spray paint that protects against radiation, contact Ecos Paints.